From key cards and keypads to programmed remote access (right from your phone or computer), M&D has the right solution for your home or business. M&D will install a remote access device so you access your home before you arrive or control entry while out. Forgot to lock the house or office? No problem with our remote access devices. Call us to learn more. M&D is more than just locks and keys. We install access control units like key pads and other electronic entry devices that may need digital key cards and key FOB units. Contact us for a full assessment of your home or business needs. M&D is one of the top providers of key FOB units in New York City. Whether it’s a key FOB for your car, home or business, M&D has the right unit for your situation. M&D Locks and Keys has a long history of installing and maintaining access control systems for New York City residents and business owners. By far, the largest demand comes from landlords and property managers of large developments and multi-unit properties. Not every locksmith professional has the experience and training to effectively install access control systems. M&D locksmith technicians are especially qualified with the most advanced units and will be able to give you multiple options and recommendations based on your security needs and property specifications. They’ll add superior security to your home or business using a proximity card, combination PIN, a biometric reader or combination of all three. 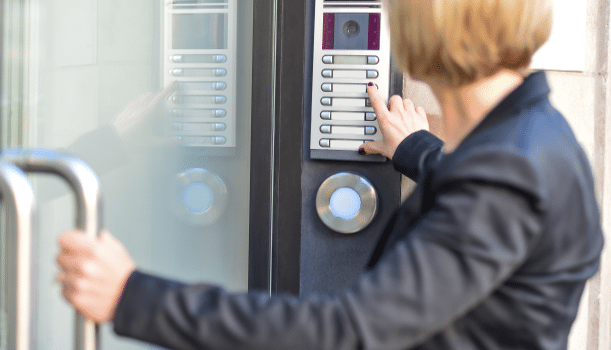 It is common for home owners or businesses to request a combination access control unit with an intercom or security camera system. M&D professionals are trained in all areas of business and home security. We can custom design a system that is right for you and your family. If you need security gates or doors, please check out our pages on this website for those items as well. If you have a security need that you feel is not addressed here, please call us at (718) 484-4050 and we will be happy to assist you with your custom security need. As New York City locksmiths, we have some of the quickest response times in the business. We are happy to respond quickly to your other home and business security needs as well, but prefer a little more time to prepare the right quotes and options for you. In either case, call us and we are happy to accommodate you in any way we can. Call M&D Locks and Keys at (718) 484-4050 for more information or if you would like to get a quote on a new access control system for your building, please go to our service request page.